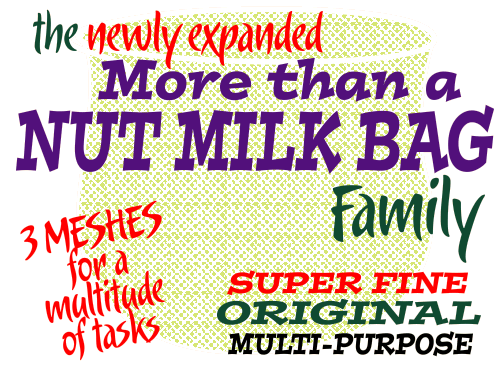 Our original More than a Nut Milk Bag continues to be the most valuable player in our kitchen, but we always yearned for siblings: a superfine mesh bag for those times when we wanted to get a velvety smooth product, and a looser mesh for products that taste better if more solids are included. They're here! 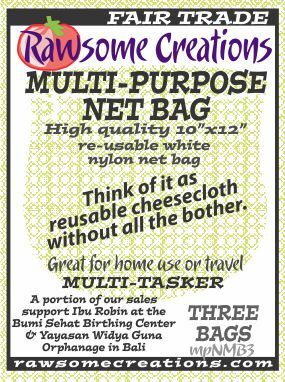 We are proud to announce the long-awaited SUPERFINE More than a Nut Milk Bag, and its coarser brother, the MULTI-PURPOSE NET BAG. For international orders please email Brenda for a quote. Remember to include your order and your address! Each nut milk bag is reusable. It can be used for nut milks (Rawsome Recipe: Almond Milk) and straining juices. It's so much easier and faster than using a strainer. The drawstring means you can just hang it and let it do its own thing! The Original More than a Nut Milk Bag is our best multi-tasker, and our constant companion when we travel. We have discovered, or been told about, hundreds of uses but it is renowned as the World's Best Nut Milk Bag. (include your address!) Quantity: Special Prices! For velvety sauces and clear juices, we want to remove as many of the tiny particles as possible. Quite often, we have used a pair of nested Original More than a Nut Milk Bags, and this served well ... but with the new SUPERFINE More than a Nut Milk Bag, a single bag'll do it! A more delicate mesh, with thinner nylon threads in a tighter configuration, we love our new bags. We have already found a dozen unexpected uses. These bags are already indispensable in our busy living food kitchen. These started out as a mistake, but some of the best things start that way! We have a limited number of our Multi-Purpose Net Bags made with more open mesh. We use them for straining large-grained products, and for storage when some air circulation is desired (as in drying beans). Husband Mike uses them to hold the hops when he brews beer, and a chef friend reports using them to keep a bouquet garni together in a soup or stew. Like the new SUPERFINE More than a Nut Milk Bags, these are consummate multi-taskers, and we have only begun to scratch the surface of the list of uses. As an enticement to try our nut milk bags, or as an ever-appreciated gift for a dedicated chef, the two-bag More than a Nut Milk Bag assortment pack -- one Original bag, one SUPER-FINE -- is a natural. contact Brenda for personal or wholesale orders! 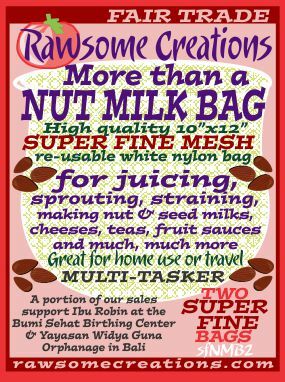 Our More than a NUT MILK BAGs are sewn in Bali, Indonesia, by Wayan and her friends. These bags are ideal for any number of straining or sprouting uses (click to learn how) and recipes are included with each one. 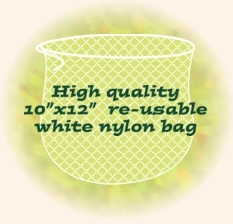 Each high-quality nylon 10 x 12 inch bag is quality tested before shipment. Wayan takes great care sewing our bias-cut fine mesh nylon bags with serge-stitched seams to improve strength and flexibility. 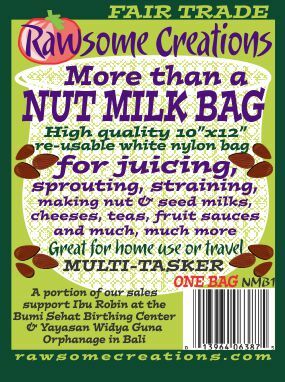 We insist that you be satisfied; we are confident that our More than a NUT MILK BAGs are the finest available. After testing bags constructed with natural fibers, we found that nylon, over time, is the only satisfactory material. Nylon, being non-porous, makes our bags easy to clean after use, so the bags stay clean and remain strong and intact for many, many uses. 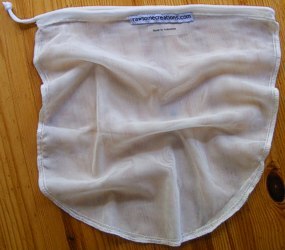 We found that natural fiber bags stain quickly and tend to add smell and taste to their contents after only a few uses, but nylon remains neutral. Just blend your choice of nuts, water and a sweetener of your choice, (agave, dates, honey) and blend in an high-speed blender (Vitamix or similar). Then strain through the nut milk bag for silky, smooth, creamy milk that can replace any diary or soy milk for drinking or in recipes. You can place the pulp from freshly squeezed juice in this bag and squeeze. You'll be amazed at how much more juice comes out! Also when traveling and you don't have a juicer handy, you can blend fruits with a little water in a blender and strain through the bag. Voilà! Fresh juice! So many uses, so little time! 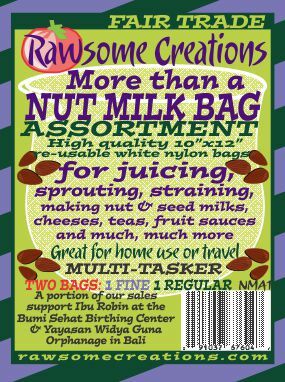 Click for more suggestions on how to use your More than a NUT MILK BAG. and we'll send you a free nut milk bag! Empty nut, veggie or fruit pulp into another bag or container and wash the bag completely under running warm water. Hang to air dry. For stubborn stains, soak the bag in GSE (grapefruit seed extract) and water.